Here are a few final shots from the MIM (Musical Instrument Museum) in Brussels. These are details of oboes, a descendant of the soprano shawm, from around 1750. Notice the extremely fine reed, and the extension key still made for playing in either the right- or left-hand down position. Here are figureheads from the pegboxes of violas da gamba. Sometimes the heads were modeled on classical figures, while other times they were carved in the likenesses of clients or patrons. I have yet to see this same style and subtlety of expression captured in the figureheads on more modern reproductions. Listed below is the music for the orchestra's next three meetings. Please note that there will be sectional seating for the Telemann Concerto, with those playing Soprano Recorder 1-3, Alto Recorder 1 and Tenor Recorder 1-2 sitting on the right as they face the conductor and those playing Alto Recorder 2, Tenor Recorder 3-4 and Bass Recorder on the left. Please observe this seating arrangement when you choose your place at the beginning of the meeting on April 16. Please note as well that sopranino, great bass and contrabass recorders will be needed at all three meetings, bassoon on April 16, bass viola da gamba on April 9 and April 16 and krummhorns and dulcien on April 9 and April 30. William (Bill) Barnhart Jr. was born Feb. 24, 1925, in Hollywood and passed away on Sept. 26, 2013, in Grass Valley. His early interest in electricity was reflected in his operator licensing and included the use of Morse Code and construction of a HAM radio as a teenager. After serving in WWII, he received an engineering degree from Stanford and began his career in the television broadcast industry in Los Angeles. In the mid-1950’s, Bill joined Ampex Corp. in the Bay Area. He spent several months in Russia during 1959 as a videotape engineer at the American Exposition in Moscow. 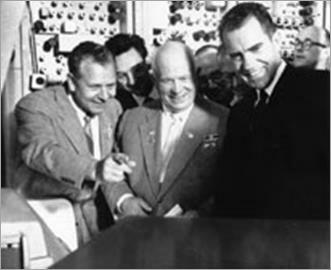 See the picture below in which Bill is running equipment behind Russian Premier Nikita Khrushchev and Vice President Richard Nixon. Bill was on the engineering team that designed early commercial grade portable (vs. studio) TV video recording equipment. Bill moved to Nevada City in 1967 to join the Grass Valley Group as employee #12. GVG was a company that produced technology and services for the video and broadcast industry. Bill was deeply involved in the Nevada County music scene, including Nevada City Theatre musical productions, instrumental and choral groups, Nevada County Concert Band, and Trinity Episcopal Church Choir. Bill was known by many as a perpetually cheerful, friendly and social guy. He is survived by son John Barnhart of Elk Grove, CA; daughter Shirley Rodriguez of Reno, NV; niece Nancy Struble of Nevada City, CA; nephew Dirk Miller of Incline Village, NV; and eight grandchildren. Bill was preceded in death by his wife, Ilse. From the MPRO files: Bill founded MPRO in 1962 and was its first music director. He was an accomplished musician, folk dancer and singer, having performed with the Roger Wagner Chorale prior to moving to northern California. Mark your calendar: Sonoma County Recorder Society and the Occidental Center for the Arts invite you to an afternoon of Music in the Redwoods with Guest Conductor Greta Haug-Hryciw, Sunday, April 6, 2014, 12pm to 4pm, workshop fee $25. For details and registration form, see http://www.sacrecorders.org/Greta's%20workshop%202014.pdf .